Background: Many of you have heard, that huanglongbing was found in a tree in a yard in Hacienda Heights in southern California. The disease was found by collecting live Asian citrus psyllids at a trap location into alcohol and testing them for the pathogen. When infected psyllids were found for this location, all the trees in that site were tested, and one came up positive for the disease. The tree was a lemon topworked with pummelo and it was the pummelo that was infected. State and Federal officials are doing traceback to find out where the pummelo bud came from. All of the trees in the area are being treated with pesticides, the infected tree has been removed and all nearby trees and psyllids have been tested and were found to be negative for the disease. We are not surprised by this situation, we have expected all along that illegal infected budwood has likely been brought in from Asia and used to create trees and the pathogen is sitting in trees waiting to be picked up by the psyllid. The CDFA site http://www.cdfa.ca.gov/plant/pe/interiorexclusion/acp_quarantine.html shows the ACP and HLB Quarantine maps. Questions are being asked as to what the grower response should be. The Hacienda Heights infection site is in an urban area, far from commercial citrus. There are only a handful of citrus groves that have had psyllid infestations (Imperial, Ventura and San Bernadino counties) and these have been treated with insecticides. 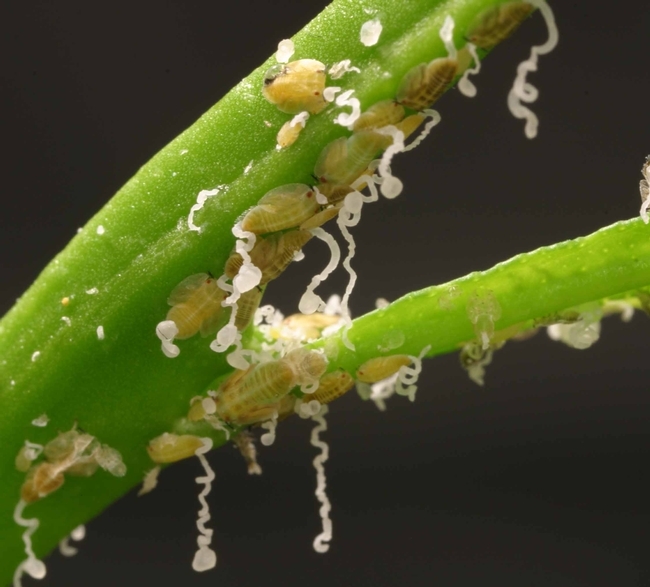 The most important thing that growers and pest control advisors can do is carefully examine their citrus trees for evidence of the psyllid during periods of flush. Insecticide treatments for Asian citrus pysllid should not be initiated until there are actually psyllids in the grove. What should I look for? You can watch for adult psyllids, but they are active and hard to find when they are in low densities. Examine tender new leaves for immature stages of psyllids. The photo shows that the nymphs are small and yellow and they produce unique waxy tubules.